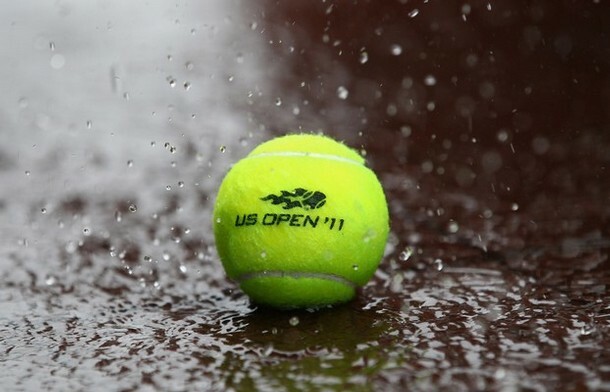 Tomorrow is the opening day of the French Open, which is perhaps my favorite major tennis tournament. [Well, actually, they are all my favorite as they approach. I’m fickle that way.] So to celebrate, I’m inflicting Roland Garros or tennis related things on the interwebs. 1. I’m entertained by the idea that I could buy a little pot of clay as a souvenir, or even a key chain with a bit of the terre battue. 3. As @TennisSavesMe pointed out, it’s LOL-worthy that Tio Toni’s bag gets monogrammed, too. But I’m a little sad the “Tio” is not included. 4. Vamos, Rafa! And the whole Spanish Armada, of course. Looking pretty smiley — so practice went well? Friday morning started badly. Baltimore’s downtown was a mess as streets were closed for the Grand Prix. MLK Blvd was a parking lot at 6am as I tried to get to the train station. I was glad I took my usual bus and gave myself an hour’s cushion rather than sleeping in, because if I’d tried catching a later bus, I would have missed the train. On the train: screaming infant + child watching DVD without earphones –> I relocated to the cafe car…where I got to listen to a guy bloviate about securitization; the downfall of society; and how the WSJ’s approach to politics and finance is his guiding principle to life. I was kicking myself for forgetting my earbuds. Quick trip to drop my bags at the hotel, then it was the E line to the 7 out to Mets-Willets station, and the walk into the Billie Jean King National Tennis Center. The 7 was full of tennis fans, and I love the boardwalk onto the grounds. It’s always a good idea to either look at the order of play before you go or to buy a copy of the draw sheet on your way in to the grounds, so you have a game plan. You probably won’t stick to the game plan (well, you might but I never have) but it’s good to have at the outset, otherwise the size of the crowd and the number of things to see and do can be distracting and bewildering — outer courts, practice courts, booths, show courts, etc. After the doubles, back to the Grandstand, where Peng Shuai and Julia Goerges played a pretty close match. In the end, Peng was the better player and won, 64 76(1). I ended up leaving midway through the second set when it seemed like Peng was in control, heading out to the Lopez/Pospisil match on Court 8. That court is very much an outer court, with aluminum bleachers only three rows deep on one side slightly taller bleachers on the other; no seating on either end. Pospisil is a promising, young Canadian player, and Lopez is one of the Spanish Armada. 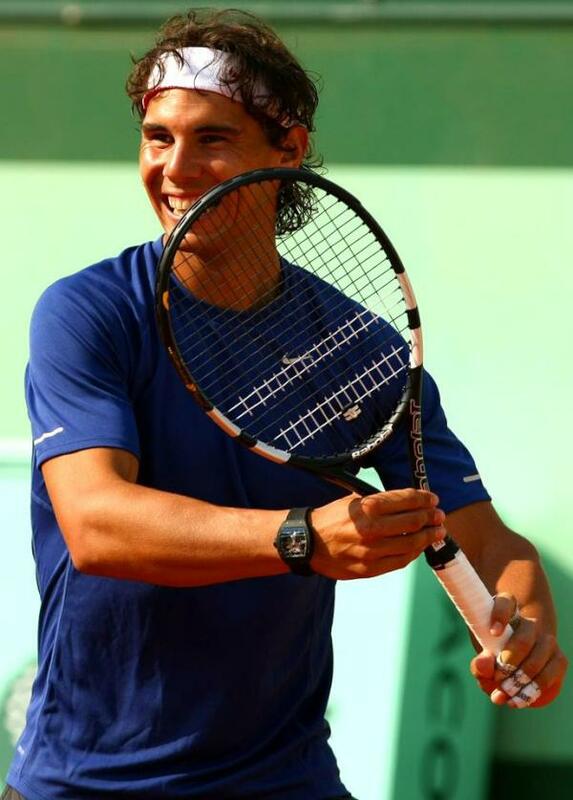 He’s often been accused of not making the most of his talent (huge lefty serve) and being distracted by looks/fashion. (He is terribly pretty.) Lopez struggled with his first serve through out the match, and there were a lot of great rallies, but experience won over youth. Pospisil had a significant crowd; they were perhaps the most obnoxious crowd I’ve ever encountered at a tennis event, even more so than the J-Block. I missed exactly what was said, but there was a pretty snarky exchange between Lopez and a few fans as Lopez won the tiebreak in the third set and then the fourth set, 57 64 76(3) 76(5). Then back to Grandstand to see the very end of the Ferrer/Blake match. 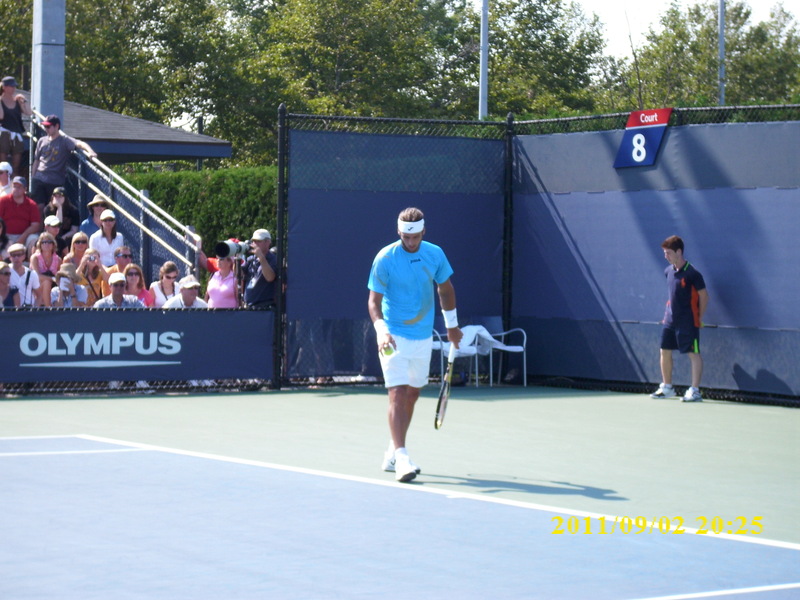 Blake is hugely popular in NYC, which meant the Grandstand was full and there was a line, but it moved pretty quickly. Got to see about half of the last set, which Ferrer won easily. Then over to Armstrong to watch Sam Stosur play Nadia Petrova. *sigh* Poor Petrova, I think her clothing sponsor hates her. The current kit looks okay from a distance and is better than the last couple of disasters, but diagonal ruching and horizontal rows of color blocks are not flattering. Stosur choked the second set away, but held on to win in the end. Instead, I went out to Court 17 and settled in for another morning of Spanish tennis. Got there in time to see Juan Carlos Ferrero wrapping up his practice session, then stayed for the ladies match (Carla Suarez Navarro vs. Silvia Soler-Espinosa, the last remaining player to come through the qualifying rounds). The ladies’ matches tend to have noticeably smaller crowds than the men’s matches, unless the woman on the court is Serena Williams. I sat in the first row on the ad court baseline; Suarez’s team sat behind me, although I didn’t realize it at first. Soler-Espinosa choked during the first set but came back and gave Suarez a hard time in the second. From there, over to the Grandstand to see Petkovic’s new dance after she beat Vinci, and to see her get the announcer do the dance as well 😀 Then Tommy Haas vs. Juan Monaco; Haas took the first set but then became a UFE machine. And then it was time for Jo-Wilifried Tsonga vs. Fernando Verdasco. Verdasco is incredibly frustrating as a player; he’s got a huge forehand and a good serve that seems to disappear at times. He’s a head case, really, and I wonder if he’d do better with a primary coach other than his father, or maybe with less reliance on the Adidas Player Program, or maybe just a sports psychologist. He played a pretty good match here, but Tsonga was just on fire and his serve was unbreakable. I didn’t have a ticket for Sunday but decided to stay an extra day and get one. Rafa Nadal (my favorite player, FWIW, in case I haven’t made that clear in earlier posts) was playing David Nalbandian, another player I like and one who has given Nadal a run for his money on hard courts. But the cheapest ticket available was $383 for Ashe, while $65 day passes were available. Apparently even if the tickets are sold out online in advance, the USTA releases 1,000 grounds passes on the day of. The box office opens at 9am; I got there at 9:30 and there were still plenty for sale. I was ambivalent about watching part of the Nadal-Nalbandian match on the big screen in the courtyard in front of Ashe: I could’ve watched it at home for free; but it was Nadal and Nalbandian! I ended up grabbing a seat at midcourt on Armstrong and staying there all day. A nice surprise — David Ferrer and Gilles Simon were practicing on the Armstrong, preparing for their upcoming matches since both were scheduled for the second match of the day on their respective courts (17 and Armstrong). First up were Flavia Pennetta and Peng Shuai, whom the announcer insisted on addressing as Shuai Peng. It was a really close match, and the crowd was very into it. The conditions were pretty hot and muggy. Serving for the match, up 30-0, Pennetta leaned against the back wall and dry heaved, then came back to serve after getting a time violation warning. Her arms must’ve felt like noodles, and she ended up being broken and then going down 2-6 in the tie break before coming back to win. The crowd absolutely loved her, especially when after being sick and getting the time warning, she rolled her eyes and grinned, then tossed the ball up to serve. Then Del Potro vs Simon. I have a soft spot for Del Potro, as mentioned above, stemming from the first couple of matches I saw him play live back at the LMTC in 2009: he joked with opponents and the crowd and was just so personable. He seems like such a laid back, soft spoken guy, and his wrist injury early in 2010 really put the kibosh on what looked like a promising year to follow his first major win at the US Open in the fall of 2009. He played a great match, especially in the first and fourth sets — I really thought he was going to push the match to a fifth set, and he looked utterly gutted as he left the court. Isner was heading on to Armstrong when I left; I don’t really care for his serve-reliant game, so I figured I’d head back to the hotel to watch the night matches on TV. Wrong! They weren’t televised! No Andy Murray beating of Feliciano Lopez! Apparently college football rules ESPN, even in NYC where the tennis was being played. It wasn’t until I was back that I learned that the Stosur-Kirilenko afternoon match was rescheduled for after 7pm on the Grandstand — I absolutely would have stayed for that, and was disappointed to miss it since my twitter feed described an amazing match. You can probably find these elsewhere, but I’ll repeat them anyway. I have a love/hate relationship with the fans at the US Open. Especially when you are checking out the matches on the outer courts, you’ll find incredibly knowledgeable fans, people who know about tennis, who play tennis, who watch tennis, who know about the players and their games. And you’ll chat with random strangers about what you love about doubles, or how you’re skipping Federer on Ashe because it’ll just be another beat-down and it looks like a better match will be going on out on Court 17, and maybe get dared by a random stranger to call out to Feliciano Lopez that he’s muy guapo the next time he’s serving at your end of the court (no, I did not). But you’ll also encounter people who think “set your cell phone to vibrate” and “no flash photography” don’t *really* apply to them. And spectators who take the match serious to the point of yelling some pretty offensive things to their favorite player’s opponent (like the Pospisil fans). The crowd at the Haas-Monaco match was a little nasty, too, especially with all the “break time” cat calls. The food vendors were both great and terrible. The food court on the grounds offers a variety of foods, deli, Asian, crepes, paninis, burgers, fries, chicken tenders, with a variety of soft and alcoholic drinks. Had a great chicken and spinach crepe from one of the stalls there. And individual carts hawking water, ice cream, nuts, etc., can be found all over the grounds. Sadly, the vendors within the stadiums (Ashe, Armstrong, the Grandstand) provided the slowest service I’ve ever experienced at a sporting event: it took 41 minutes for the 10 people in front of me to get their burgers/chicken tenders/fries; and they ran out of bottled everything (water, tea, gatorade) by 3pm. Maybe they were waiting for more to be delivered? I don’t know, but I was not impressed. I think I’m probably going to take a break from the Open next year; I’ll be going to Indian Wells, and probably a day or two of the WTA and ATP tournaments held in August in the DC area, which will give my budget a break and also let miss the tournament a little, and appreciate it more. Have you subscribed to Beyond the Baseline? It’s the reimagined SI tennis blog, run by Forty Deuce. Check out this HuffPo piece and gallery on Tio Toni, in which he says that right now Djokovic is just playing better than Rafa. All photos by jmcbks except the first photo, as noted above. Ignore the time stamp — my camera is several hours ahead for some reason, and I can’t find the manual to figure out how to fix it. Several years ago, I was outside all day at a street festival and needed a hat. I never have a hat when I need one. Of course, the reason is that I look like a complete dork in a hat. But still, sometimes one must have a hat, or suffer from sunstroke. The choices were limited, and I ended up spending $10 on this blue hat that I figured I would wear once and then misplace or forget. But several years later, I still have the hat. It has accompanied me to California and Ireland and Spain, and to different beaches up and down the East Coast. The design is really simple — it’s a single piece of extremely sturdy ribbon, sewn (sown? no, sewn, I think) over itself, with the placement of the stitches determining the shape of the hat. It squashes down to almost nothing, making for easy carrying. It’s easily cleaned, just toss it in the washer and then let it air dry. The brim adjusts, which is useful depending on the angle of the sun. Of course, I do occasionally forget even the Awesome Blue Ribbon Hat, and end up buying the cheapest hat available. Which is how I ended up with a Rafa Nadal/Nike baseball cap from the US Open last year, and a USOpen fishing-style cap the year before. Yes, I’m a don’t-forget-to-pack-a-hat failure. And I look like an even bigger dork in ball caps than I do in other hats. While I was gift shopping a Barnes & Noble over the holidays, I also bought a gift for myself — it’s cheating, but I did it anyway: this little carrier-type bag made of recycled juice boxes. The colors were so bright and cheerful. I use it to carry my lunch to work, or as little handbag when I’m out running errands. Several people have stopped me and asked if I made it or where I got it. I’ve mentioned before that my kitchen is not particularly well-equipped. This does not distress me. But I still oooh and aaah over kitchen accessories, like this selection of butter yellow gadgets featured by Metrocurean. I don’t need a butter dish, yet I’m tempted by the color. Same for the baking dishes.